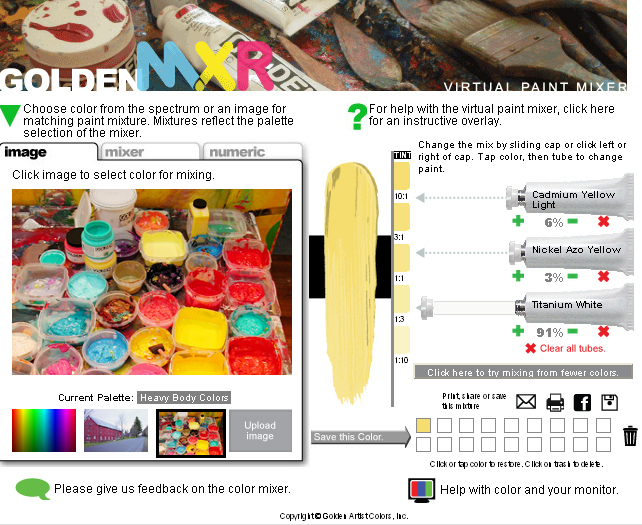 Art & Frame of Sarasota: Golden's Virtual Paint Mixer-Try It Now! Golden Artist Colors has recently launched a new tool called the GoldenMXR which allows users to match colors from uploaded images. 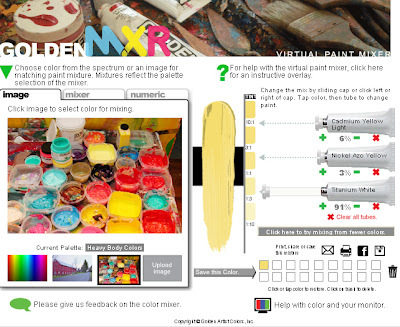 The Virtual Paint Mixer provides the exact mixture (example: 10% Medium Violet, 60% Titanium White, 30% Neutral Gray N7) of Golden Artist Colors to create the selected color. This description does not do it justice--experience it for yourself! Click this button to open GLDMXR in a pop-up window. What a unique tool. Extremely helpful.